So for this article first we will create a new asp.net mvc application and add a model class file into model folder. After creating model class file add the below code. Now we will add a controller file into our controller folder and add the below code into your controller file. In above code for assigning data I have added string value to the country name and the population. Value in population is dummy not real J. This string values we will we will further used for converting into array collection. Now we will create view and in your view add the below code. Please check the below mention part of the code. In above code we are preparing array of the string which we have passed in model. 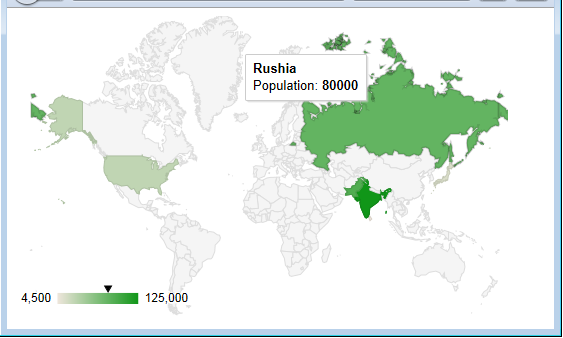 In case of string first I have split the country name and then made the data for passing the Google chart api. Thank you so much for offering this creative.